WASHINGTON, D.C.—It is morning and the sun is rising. All of the monuments’ white hues blend together against the light that surrounds them. However, there is one structure that is different and stands out among all the others. It is striking in its appearance and invokes one to move closer to it as its bright golden color and curvy body ascends to a spiraled sun-lit dome, making it glisten for all to see. This is the Smithsonian’s National Museum of the American Indian. The modern exterior of the National Museum of the American Indian on the National Mall in Washington, D.C. (Photo by Danielle Cohn). 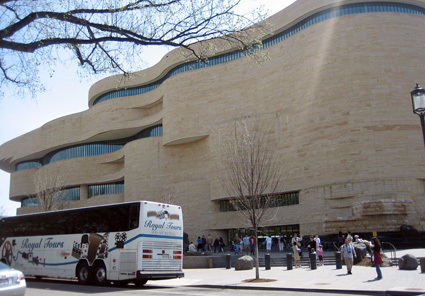 It is the first national museum in the country dedicated exclusively to Native Americans and the first to present all exhibitions from a Native viewpoint and the first to be constructed on the National Mall since 1987. The museum officially opened its doors to the public on Sept. 21, 2004. “The Smithsonian is honored to present this vital museum, created by Native peoples from this hemisphere, to the American public and visitors from around the world,” Smithsonian Institution Secretary Lawrence M. Small said. At its base, the front steps lead up to a cascade flowing over boulders known as Grandfather Rocks, which serve as reminders of the longevity of Native Americans’ relationship to the natural world. These four settings comprising the museum’s grounds were created in an effort to honor Native peoples by displaying a mixture of their living environments. Donna House (Navajo/Oneida), an ethnobotanist, can be accredited with guiding a design team through this project and for making it come to life. The landscape features more than 40 rocks and boulders. There are also Cardinal Direction Marker stones from Maryland, Canada, Hawaii and Chile that are four special stones placed along the north-south and east-west axes of the center of the building. As the visitor walks along, he or she is immediately engulfed into a habitat completely opposite from that of D.C. and into one comprising more than 33,000 indigenous plants of 150 species and more than 25 native tree species, including red maple, staghorn sumac and white oak. In the wetlands region of the landscape wild rice, marsh marigolds, buttonbush, cardinal flowers water lilies and silky willows can be found. In the meadow buttercups, fall panic grass, black-eyed Susan, and sunflowers are abundant. Then in the cropland area visitors will see corn, beans, squash and even tobacco growing. 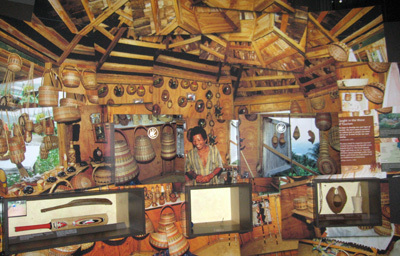 “I promise when you visit the building on the Mall you will witness the integration of built space and the non-built eco-environment that surrounds it in recognition of the aesthetics of wholeness so intrinsic in Native artistic outlook, the color and texture of the stone cladding of the building that evokes the earthly connections Native people feel so profoundly, the abundance, within and without the building, of the most beautiful and essential elements of the natural world such as flowing water, natural light, plant life and grandfather rocks,” said museum founding director W. Richard West Jr. (Southern Cheyenne). Thus, such a surrounding makes for an invigorating experience of being immersed in a beautiful surrounding of nature’s sights, scents and sounds. It is truly captivating and is the beginning of the National American Indian Museum experience. After strolling along the outdoor perimeter, it is time to enter the actual museum for the second part of the tour. This five-story, 250,000-square foot, curvilinear building was built on the last open space available on the National Mall, located between the Smithsonian’s National Air and Space Museum and the U.S. Capitol. The textured golden-colored limestone exterior evokes natural rock formations formed by wind and water through time. 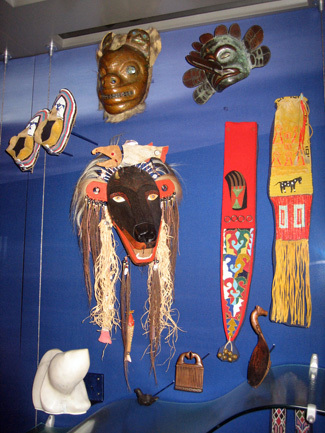 From the moment visitors set foot inside the museum, they have a sense of a Native place. The most special feature of the museum is the symbolism in its unique architecture and artistic design. Its entrance was built facing the east toward the rising sun (showing the Native Americans’ appreciation for energy from the sun) and the back doors facing the moon, representing equality. The numerous circular shapes/web-like patterns portrayed throughout the interior walls and floors and ceiling represent the circle of life. The ground floor is aligned to the four cardinal directions (North, East, South and West) and to the center point of the Capitol dome. A red marking on the center part of the floor indicates the heart and center point of the museum and is directly lined up with the center part of the dome, which has an 120-foot-high atrium called the Potomac, with a prism window at its center. This direct linear placement symbolizes the connection of land and sky. 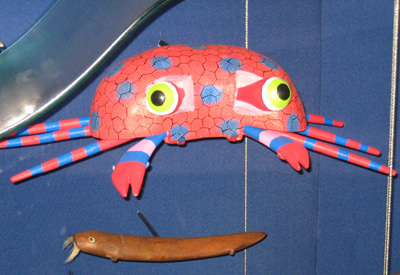 One of the numerous colorful exhibits in the museum (Photo by Danielle Cohn). The building of this 250,000 square-foot museum was a collaborative effort, one that was designed in consultation with many Native Americans during a four-year period. It was designed by Douglas Cardinal (Blackfoot) and a team of Native architects and consultants and is filled with symbols and forms that reflect the Native universe, including representations of nature, astronomy and objects from the collection. It is captivating when the sun shines through the dome prism, specifically at noon from north to south, and illuminates the ground-level stone floor, displaying a rainbow light across the floor. This symbolizes the Native solar calendar, which forms the basis for how they live their lives day to day. Established by an Act of Congress in 1989, the Smithsonian’s National Museum of the American Indian is founded on the collection of the former Museum of the American Indian/Heye Foundation, in New York City. The collection is distinguished by more than 800,000 works of aesthetic, cultural, historical and spiritual significance. These objects span more than 10,000 years of Native heritage in the U.S. (including Hawaii), Canada and Latin America. Showcased pieces include beadwork, pottery, textiles, paintings, sculptures, among others. A great way to start off the journey through the museum is to see the 13-minute film, “Who We Are,” in the Lelawi Theater on the fourth floor. The dimly lit dome theater is lined with glowing glass cases that showcase exotic Native American masks and artwork. Its circular seating arrangement provides a unified, community-like atmosphere for the crowd. This short introductory film provides a touching glimpse into the life of Native American life today. “Land is not a being that should be possessed. It has emotions and according to how we treat it, it will treat us. For we believe Mother Earth is a goddess. She gives us food and fertility,” states one of the Native American narrators of the film, who quickly delves into the Native concept of peace and respect for nature. The movie provides the average American with an understanding of Native American culture and how old traditions are fought for and kept strong through generations. It is uplifting and paves the way for the rest of the visit. The three main exhibitions featured at the museum are “Our Universes, Our Peoples, and Our Lives.” These three exhibitions present approximately 8,000 objects form the museum’s world-renowned collection of more than 800,000 items. Through these interactive multimedia exhibitions, 24 tribes and Native communities tell their histories and stories in their own words, making the experience an incredibly poignant one. “Our Universes: Traditional Knowledge Shapes Our World” focuses on the creation of Native philosophies and worldviews based on the creation and order of the universe. The beautiful dark interior of the exhibit is striking as a setting, resembling that of a night sky filled with bright stars, illuminates it. Images of the moon and sun lead to a number of colored diagrams illustrating the four cardinal directions and how each tribe has defined the meaning of each with animal connotations to direct them in their daily lives. “Blue stands for the North and represents birth, white stands for the East and represents the youth of the nation, red is south and represents the adults of the nation and Yellow is west and represents the elders and death. All four of these represent the cycle of life by embodying all states of life, so the number four is sacred for this nation,” said Jose Montano, tour guide for the National Museum of the American Indian. 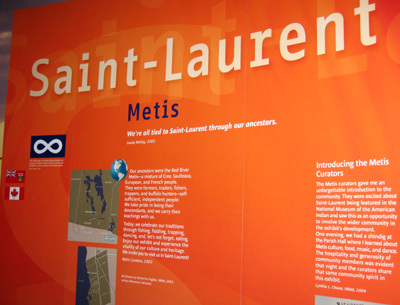 This exhibit highlights the Saint-Laurent Metis tribe of Manitoba, Canada (Photo by Danielle Cohn). Organized around the solar year, the exhibition also highlights seasonal celebrations that bring Native peoples together, such as the Denver March Powwow, Day of the Dead (which closely resembles Halloween), and North American Indigenous Games. “During the spring season, this nation comes together to celebrate the New Year so for their ceremony they use special ceramics, music and dances. And the creation of the ceramics is based on the four states of life: they use clay from the earth, water to mix, air to dry and fire to cook,” added Montano. Our Peoples: Giving Voice to Our Histories focuses on events that shaped the lives and outlook of Native peoples from 1491 to the present. The exhibition examines how disease, guns, Bibles and governments affected the Native people’s lives after 1491, with struggles to maintain their traditions in the face of adversity. 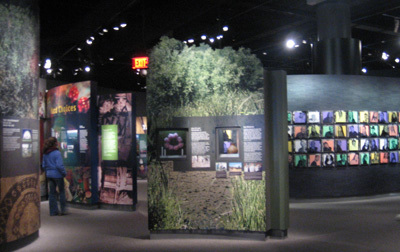 Eight small galleries are displayed where the Seminole Tribe (Florida), Tapirape (Brazil), Kiowa Nation (Oklahoma), Tohono O’odham Nation (Arizona), Eastern Band of Cherokee, (North Carolina), Nahua of the Rio Balsas (Mexico), Ka’apor (Brazil) and Wixarika of Bancos de Calitique (Mexico) reflect about their past and share stores on events that have shaped them as distinct peoples. It becomes even more mesmerizing when you turn the corner to discover the real weaponry artifacts, including huge guns, being displayed inches before you, making the concept of deadly historical struggles ever more realistic. There are also tool artifacts displayed that verify the transitional technological development in their societies post-1491. “White guns, the guns in this wall, tell a story of destruction of a person and resistance. The guns forced the Native peoples to go out, helped to divide the land and took Native lives. Yet the Native peoples also used guns for hunting, for trade as well as to defend the ancestor land,” explained Montano. Such a balance of destruction and opportunity clearly changed the lives of the Native Americans forever, as they were ultimately forced to use such technological “gifts” for their own survival. This exhibit highlights the lives of Native Americans (Photo by Danielle Cohn). Last, but not least, is the Our Lives: Contemporary Life and Identities exhibit, which explores the cultural, social, linguistic and political aspects of Native people and communities in the 21st Century. Numerous interactive multimedia presentations and photographs are displayed featuring adolescent and older Native people in the 21st Century commentating on their lives today and how they are trying to move with the times while maintaining their cultural identity. Indian casinos, for example, are now open on many reservations and, as Montano explained, have brought both wonderful opportunities for lifestyle improvement and have broken down Native traditions of emphasizing games and commercialism. “Since we opened up the Golden Acorn Casino pretty much anyone who wants to work is able to find a job,” said Ralph Goff, one of the men affiliated with the casino business on the Camp reservation, in a commentary video clip. Jeci Goodleaf, a student at the newly established “Survival School” that teaches young Native children their peoples’ language and culture is thankful learning Kanienkeha, her Native language. “Everything is based on our language, if we don’t have our language then we don’t have our culture,” Goodleaf stated in another brief video feed. On the way down to the first level it is imperative to stop by the Window on Collections: Many Hands, Many Voices, which is visually beautiful in its presentation of more than 3,500 colorful, diverse Native American objects. 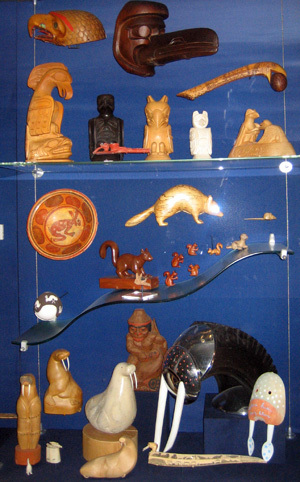 Housed in drawers and glass-fronted cases, objects are arranged by categories, including beads, peace medals, arrowheads and other projectile points, containers dolls and objects featuring animals. The vibrant animal masks make for an exciting display of eye candy with their bold facial expressions and creative imaginative design. They are highlighted pieces in this exhibit because they hold principle roles in Native ceremonies and rituals. “Many of these masks from 1200 and 1400 AD were used for funerals. But it is important that you understand that we don’t believe in death. “Even in my language (Aymara), we don’t have a word to describe death. If some person dies we say he or she moved to another place and to pass away is a sacred obligation. “It’s a powerful tool to get us to this invisible energy to create the cosmos,” explained Montano. And all of the colors used in masks are paralleled by certain meanings and help to imply their significance: red represents fire and ceremonies to present us with unity, black stands for integrity, green for future, blue for creation of the universe, time, space, fertility and abundance, and yellow is life and energy. These colors not only distinguish the specific purposes behind such creations but also enable the Native people to read and write their histories as well as every day life. One should also make time for a quick lunch break at the Mitsitam Native Foods Café that offers a delectable array of Native-inspired meals and snacks encompassing foods from the Northwest Coast, the Great Plains, Northern Woodlands, Central American and South America. Such specialties include Indian taco on frybread, smoked salmon, and buffalo burgers. If time isn’t an issue, be sure to also inquire about special theater performances, lectures or film screenings at the Welcome Desk on the ground level. “The Native women’s dresses presented in “Identity by Design” illustrate the evolving identity of Native people and communities. The exhibition and the cultural art programs to be held in its celebration concurrent with Women’s History Month also demonstrate the National Museum of the American Indian’s active role as a cultural center for civic achievement, said West Jr.
By the end of the day, you will feel enriched with a new understanding of the Native American people and sense a stronger bond with nature in its purest form. Through the tranquil outdoor premises to the genius symbolic interior design accented by the astounding beauty of preserved artifacts and maybe even a sweet treat for your palate, you will find yourself in awe of such a peaceful and respectful group of people. It is nearly impossible to witness the magnitude of such an enormous collection in just one day and may therefore be preferred by some to stretch out over the course of two or three days. However, no matter how much time you have, “Its importance can’t be over estimated; it’s a must-see for anyone visiting the nation’s capital,” Smithsonian Institution Secretary Lawrence M. Small said. One thing is for sure; the Native American people have a strong identity and an open heart that enables them to forge through time with a consistent appreciation for the new while never losing sight of the past. Hours: 10 a.m. to 5:30 p.m. daily, closed Dec. 25. Nearest Metro Station: L’enfant Plaza (Blue/Orange/Green/Yellow lines). Take the Maryland Avenue exit. Tours: Monday through Friday at 1:30 p.m. and 3 p.m. and on Saturdays and Sundays at 11 a.m., 1:30 p.m., and 3 p.m.
Mitsitam Native Foods Café Hours: Daily, 10 a.m. to 5 p.m. Note: Video or audio recording and flash photography are permitted. The museum is also fully accessible.